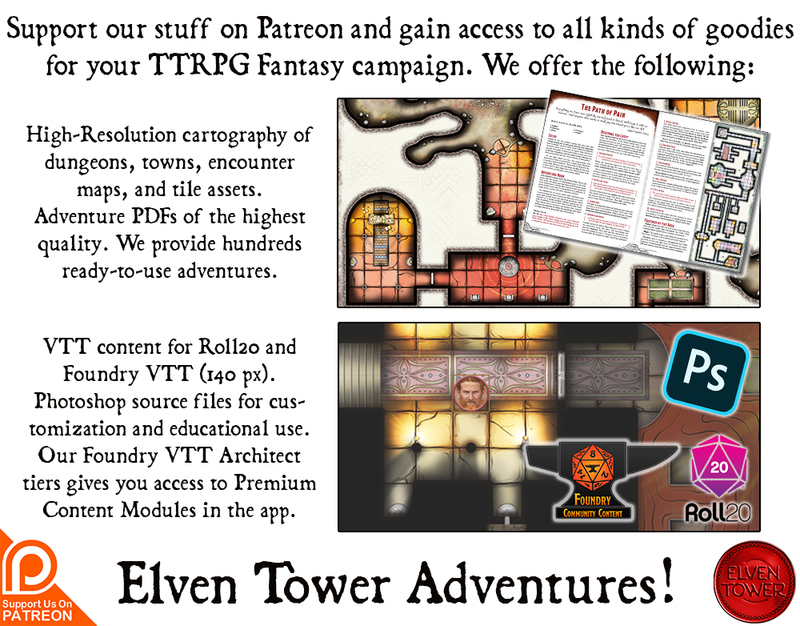 This resource features a general description of an elven tree outpost, it includes adventure ideas that are appropriate for low-level (levels 1 to 5) adventuring parties. Challenge Rating (CR) is calculated using a party of four as the model. Feel free to change or modify any or all the information found here. NPC names and settlement names are the first you should consider changing to accommodate your homebrew world lore. To modify the challenge rating of the adventure, you must first consider the power level of your party. Considering the PCs’ individual levels and number of players is crucial to presenting a good challenge. Not all parties are the same, different playing styles and command of the system in your party can increase or decrease their effectiveness in encounters. You may adjust the encounters slightly by adding or subtracting monsters. Alternatively, controlling monsters with more intelligence and strategy is often the easiest way to raise the difficulty of an encounter. Holding to one of the tallest branches of a Father Tree, a lone elf stood staring at the far horizon. He was old by human standards, but barely an adult in the elven society. He was slim; tattoos of tribal shapes decorated his bare skin; his hair braided in the traditional hair knot of his people. His name was Fedirenn and he was the youngest son of a great elven lord. He wore a platinum bracelet with an emerald star in his left ankle. Humans, dwarves and other lesser races would always think it was a piece of jewelry, a trinket of sorts. The lesser races did not know a thing of elven culture. Fedirenn wore the bracelet because he was bound to. Such bracelet was a mark of shame among the elves. Only an elf who dishonors his family to a great degree is given such a bracelet; dishonored elves are often sent to their realms borders to serve as scouts until they atone for their actions through service. And that was Fedirenn’s fate, he scouts the border with the lesser human nations from an outpost in a Father Tree; he has been there for the past thirty five years. Only his father and lord can relieve him from this status when he proves his worth. Fedirenn is stricken by grief; he ponders for hours about the ephemeral lifespans of humans. Maybe there is something to it that elves ignore, humans are faster in their endeavors and happier overall than elves. Would it be because they have less time to do all? Humans often think of elves as serious and aloof; there simply is no way for them to understand the real meaning of grief. It is the mind killer for any elf. Fedirenn knows of many elves that succumbed to grief and did the unthinkable: they either take their own lives or leave on an endless journey west that unavoidable is their end. And Fedirenn feels the growing claws of grief take hold of his thoughts and moments of solitude. Inside him there is a constant warfare between feelings of sadness and anger. Anger is so un-elven, but it is sometimes the only solace against more dangerous thoughts. Needless to say, Fedireen has grown desperate in recent years. He sings laments and poems every nightfall with his fellow scouts to appease his thoughts to no avail. The other scouts in his patrol are not so different than him; orphan boys, low-born elves, dishonored sons; but Fedirenn is son to a great lord so he is in charge. The other elves respect him for his bloodline, but it is getting late for Fedirenn to recover his status, even more so since two other elves were relieved from their duties five years before. Fedirenn is determined to impress his father in the short term, which amounts to five or ten years. His scouting labors are boring and unworthy of him but he will do his best to protect the elven realms. Should he encounter foreign travelers crossing his lands, Fedirenn pretends to capture them, interrogate them and if they are of any worth, bring them to his father to face the elven courts. 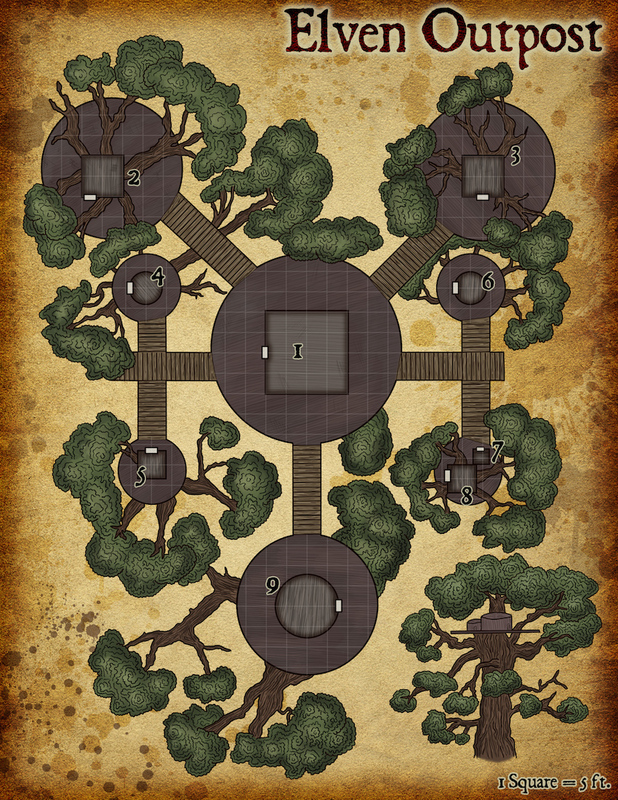 Fedirenn’s outpost is built on the branches of a Father Tree. A Father Tree is a type of oak tree created by elves. The sapling is blessed and nurtured from an early age; enchantments are imbued in its bark with runes of power. These trees grow to enormous sizes. They are slightly taller than the trees around them, but wider and sturdier. Elves grow them deep in the forests, a traveler can only see them when they are next to he tree. The outpost features several house-like buildings in the same tree, they are interconnected with hanging bridges. Everything is made with wood and other natural materials. The outpost is camouflaged with vegetation and the forest canopies. When seen from below it is hard to distinguish it from the rest of the tree tops. A Passive Wisdom (Perception) score of 16 or higher reveals the presence of the wooden platforms of the outpost. The outpost is 90 ft. high. Elves use ropes to climb up to it. There are ropes on each platform but they are only dropped when another elf wants to climb, they whistle imitating a local bird to signal their comrades they want to go up. The tree bark is grainy with rough texture, to climb the tree a PC must succeed on a DC 13 Strength (Athletics) check to climb his speed, failure by 5 or more means the PC falls to the forest ground taking falling damage (1d6 per 10 ft.). If a rope is dropped or the PC uses a climbing kit, the check is rolled with advantage. A character who witnesses an elf whistling to call for the rope can attempt to replicate the bird call. To whistle like a local bird a PC must succeed on a DC 14 Charisma (Perform) check. After successfully whistling, a rope is dropped 15 seconds after. If the PC fails by 5 or more the elves in the outpost recognize the fake call and are on alert, a group of 4 elf Scouts (MM p.349) are sent to investigate. The central platform is reserved to the patrol leader; it is the biggest in size. Fedirenn (Veteran, MM p.350) sleeps here. His room has one stray bed, a cupboard, a table with a map of the forest and a chest with his personal belongings. Fedirenn owns a magic sword of elven origin. It is considered a +1 sword for his attacks and damage. For higher level parties (levels 4 to 5) use the Gladiator (MM p.346) stat block for Fedirenn. Fedirenn’s second in command sleeps here, her name is Adaranna (Veteran, MM p.350). Her dishonor to her family was bad enough that she does not expect to recover her status ever. She wishes Fedirenn would either be called back to noble house or die so that she would become the first scout. Given the proper circumstances Adaranna could betray him to take his place. No churches or chapels are ever built on outposts. The Father Trees are godly to the elves. The praying room features a wooden sculpture of the elven goddess of nature and fertility. Elves gather here at night fall to sing laments and tell stories. The wooden sculpture’s eyes are embedded with emeralds. The two emeralds are worth 100 gold pieces each. The sculpture is surrounded by offerings, most of them are flowers, weird looking stones and braided vines. Watch towers are built on lower branches to scout the forest below, they are 20 ft. below the main platforms. There is a small room where weapons are stored. At any given time, there are 3 Guards (MM p.347) and 1d2 Scouts (MM p.349) in the watch tower. This small room is used to store dried food. Dariend (Druid, MM p.346) is the only elf in the outpost who is her of his own volition. He is an old elf (by elven standards); he moved to the outpost seventy years ago to the outpost. When he was just a child, he helped plant and nurture the Father Tree in the outpost, that was almost eight hundred years ago. Dariend feels a close connection to this Father Tree and wishes to spend the rest of his live with the tree. The elf guards and scouts sleep here. They share the chamber and sleep beside each other. There is not much of value in this room. There is no exact number of elves noted in this resource. It greatly depends on party level and size and how they approach the adventure. The adventure can go in different ways. The elves can try to apprehend the PCs for trespassing. Or the PCs might choose to explore the elven camp if they are looking for trouble. Regardless of the way they approach the adventure, an important element is how Fedirenn is grief stricken and desperate to recover his status among the noble elves. If things go sour for him and the battle is lost, have Fedirenn take his own life as he cannot bear the dishonor of failing once more. He could slit his own throat or jump to his death from the outpost. While the elves have a sense of duty and will risk his life to protect the realms, when things are clearly against them many will lay down their weapons and surrender. 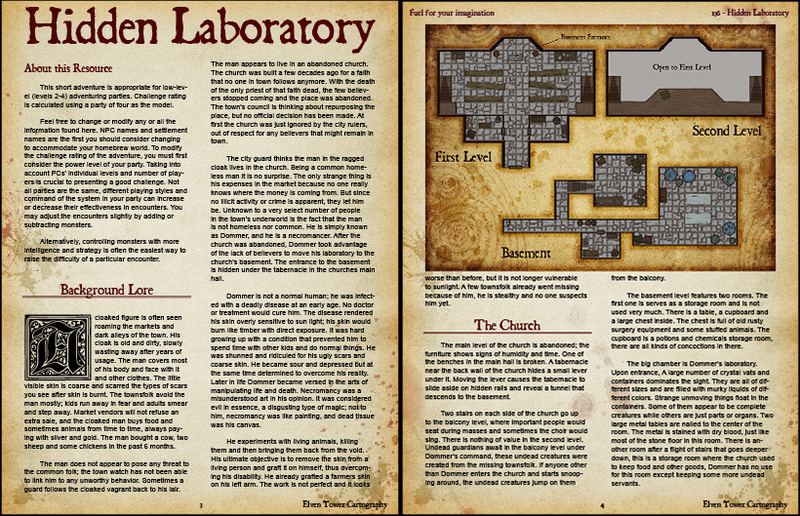 This resource is released in PDF format in my Patreon page, this is a preview of it.